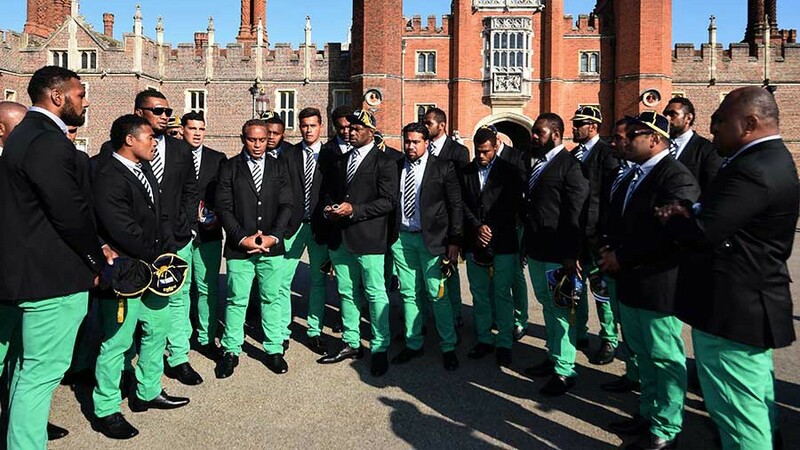 The 'Flying Fijians' have lived up to their name of being one of the great entertainers of world rugby before the Rugby World Cup tournament has even begun, serenading tourists with a hymn at Hampton Court Palace. The Fijians were the first side to be officially welcomed to the tournament on Thursday and showed their appreciation with a show of their own. Receiving their official tournament caps and participation medals, the Fijians were serenaded by a school choir from Essex and were treated by a three-piece band playing pop covers before they entertained the crowds with a hymn Fijian captain Akapusi Qera called "My Prayer". The Fijians will open the tournament with hosts England on Friday at Twickenham and the island nation has warned they are not there to fill in numbers: "We are so blessed to be here but we are here not to make up the numbers, we are here to perform," Qera said. Playing alongside Australia, England and Wales in the 'Pool of Death', Fiji winger Namani Nadolo is adamant the Fijians have the skills to make it out of the toughest pool of the tournament. "Good. We love that, that we're sort of the forgotten side," Nadolo said. "We go into the competition with nothing to lose; those guys [Australia, England and Wales] go in with everything to lose. "We're really excited. We've done everything we possibly could to be here and hopefully we can put some smiles on people's faces and have fun. Plain and simple, we didn't come here to lose. We've worked really hard as a side. Definitely looking forward to it. We can shock the world."